While my front and side yards have more formal gardens, the back was left basically wild, looking out on the surrounding woods. At this time of year we often have turkey visit to eat the sunflower seeds. Deer also come, but this year I think the surrounding fields are filled with corn from the harvesting early in November. I’ve seen them around, just not out back. Normally a pack of seven very large males visit, followed by blue jays and morning doves. 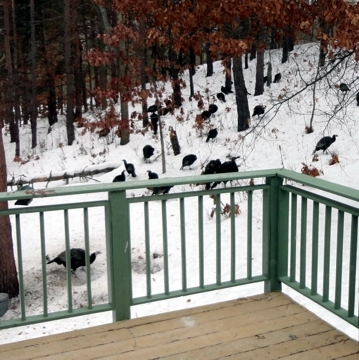 One day last week over thirty turkey came to eat. It’s fun and peaceful to look out the windows and watch them. They must have very good sight and hearing because any sudden movement or too loud comment sends them trotting up the hill.